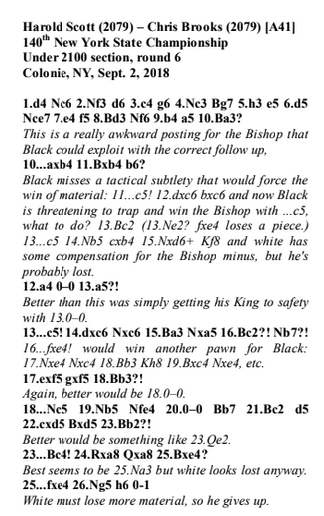 Published four times a year, Empire Chess is the official magazine for the New York State Chess Association. The current issue, Fall 2018 (click here), has a story on recently held NY State Championship. As our very own Chris Brooks shared first place honors in the Under 2100 section, it was nice to see his last round game against Harold Scott featured in the story. I encourage everyone to check out the magazine, but see below for the game itself. The Keith Delia Memorial tournament has been added. It will run on (Saturday) October 20 starting at 9:30 AM. It will not be played at Vassar College, Rockefeller Hall. Instead, it will run at Secretary Ernie’s church at 469 Coldenham Rd, Walden, NY 12586. Thanks to Ernie Johnson for the space to run the event. Details have been added to our events tab. I would like to put a quick blurb on our parking situation near Rockefeller Hall (especially for the club championship/DCC weeks). Our directions page is here to get to the area. Once on that side road on campus, across from Rockefeller is a rectangular parking lot with about a half dozen spots (driving south its on the left, north on the right). These fill quickly on our busier weeks. On the same side of the road, you will see a street (one-way against) feeding into the intersection. Loop around the main building to net five more spots after those designated for admissions. Alternatively, making an immediate right from the north gate is the main visitor parking lot, even though the walk is a bit long from there. Follow the street behind the lot, it turns south and leads to more parking, although these spaces also fill quickly, although not as quickly as the set mentioned above. There is parking on the main gate driveway right after the guard shack, but I have almost never seen parking there, although I have observed some members walking in that direction when leaving. Maybe I’m just unlucky. Finally, there’s parking on Raymond Av itself. There’s a break in the stone wall with an iron arch gate and (I believe) a sorority/frat across the street. A pedestrian path leads into the campus. Parking there and taking that path will lead pass the library, and Rockefeller Hall is the next building. This is the most surefire way to get a spot if you notice its 715 and everywhere else is full. In almost every case I have been able to pull right up next to the arch itself. Happy parking and we’ll see you next week at our club championship. The club championship will begin next Monday (September 17). It is highly recommended to arrive at the playing site between 6:30 and 7 (as supposed to the normal 7 – 715), as parking is limited at our high turnout events. The club reopens for business on Monday, September 10 with an unrated blitz. Our club championship commences on Monday, September 17, and runs for five rounds. Our Autumn schedule has been added, and it will “kick off” on September 10. Some events have been omitted temporarily but will be added soon! John Weigand finished with a disappointing 3/4 in the u1800 section at the recently completed Bradley Open in Windsor Locks, Connecticut. The upcoming NYS Championship over Labor Day weekend should feature quite a few regulars. A reminder that the club will have a three week hiatus, with no meetings on Aug 20, 27 and Sept 3. Normal business will resume with the Club Championship on the 10th. 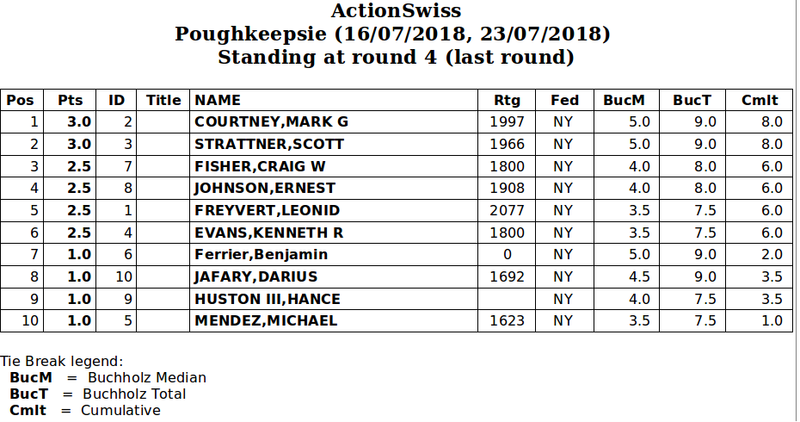 Ten players competed in the dual-rated (G/30 + 10 sec delay) Action Swiss. While the playing area at Vassar was hotter than a Native American sweat lodge, the action at the boards was even hotter. Well, at least that’s what I imagine a professional journalist writing. I’ll keep the hyperbole to a minimum from here on out. When the dust and humidity had settled, two players shared the top spot with 3 out of 4 points: Mark Courtney and Scott Strattner. Shared? What do you mean? This is chess, there is no sharing, there must be a winner! So, there we have it. Scott edges out Mark in the 4th tiebreak, 21 – 20. Writing this post was more grueling than facing Craig’s French defense (and that was grueling!). As listed in the event schedule, a trophy is also given to the top Booster (best score in bottom half of participants by rating). So who is the top player in the bottom half? Although it is close, the answer is Ken Evans! Finally, while appreciative, the winner and TD will not accept a trophy, thus providing more money to the club (and getting us that much closer to hosting another GM simul, hopefully).